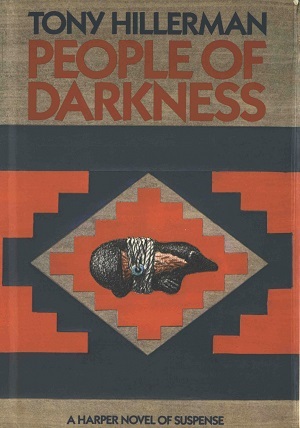 This is the first edition of People of Darkness. The fourth book in Hillerman's Navajo Mystery Series, The Dark Wind is the first novel featuring the protagonist Sergeant Jim Chee of the Navajo Tribal Police. This edition was published in 1980 by Harper & Row in New York City, New York. The jacket design and illustration was designed by Francesca Greene and features a black stone bear fetish inside a blue, tan, and red geometric design. This edition also has two fold-outs, the front fold-out contains a brief synopsis of the novel and the back fold-out contains brief reviews of Tony Hillerman's previous books by various magazines and newspapers. Binding: Gray boards with a red cloth spine. The author, tile, and publisher are printed in silver vertically on the spine.